Let those words hang in the air for a moment. Such a simple thing, so obvious… but chances are you’ve never seen it. Beer vinegar is a close cousin to malt vinegar, which you probably have encountered, at least with your fish and chips. The biggest difference is your base product. I’d heard references to beer vinegar while reading lots of German cookbooks; it’s apparently a big thing in Bavaria. 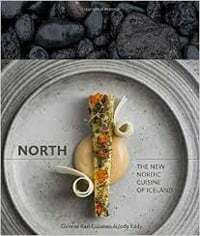 But I didn’t really start making it until I read Gunnar Gislason’s North: The New Nordic Cuisine of Iceland, which has become my favorite cookbook this year. Chef Gislason uses it because it makes far more sense to use a malt-based vinegar in Iceland than it does a wine or citrus-based acid — they make beer in Scandinavia, not wine. And forget about citrus, obviously. His recipe doesn’t really get into the details of what beer and why, so I started playing with it. It’s freakin’ amazing. First of all, you have so many different beers to choose from. Vinegar made from Budweiser will be different from vinegar made from Guinness, or from an India pale ale or a porter or a lambic or a Belgian tripel… you get my point. Red wine vinegar is pretty much red wine vinegar. Yes, there are good examples and bad ones, but there’s a certain sameness to them all. The diversity of beer vinegar is more like that between red wine and white wine vinegar. Come to think of it, beer is even more diverse than wine. And what’s more: Beer is the perfect medium to make vinegar. If you’ve ever made wine vinegar, you might notice that some wines are simply too strong for the acetic acid bacteria to handle. I’ve been making red wine vinegar for several years and I always find that I need to dilute it with water to lower the alcohol content, otherwise the “mother” won’t take. Beer, however, is typically 3.2 percent to 12 percent alcohol, with most good ones around 6 percent or so. Perfect. 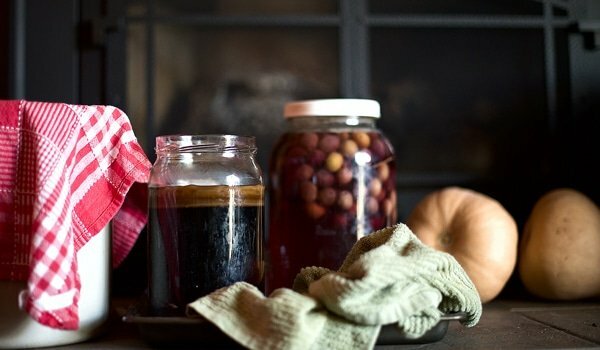 How do you make beer vinegar? Easy. Get yourself a big, wide-mouthed jar, or better yet, a stoneware 1 gallon pickling crock, or hell, get a two-gallon crock if you plan on making lots of vinegar. Pour some beer in there and add a vinegar mother. The mother I just linked to is a nice, neutral one, but honestly it doesn’t matter if the mother came from red wine or white wine. They’ll all work. Only thing is that a red wine vinegar mother will be, well, red, and so you might not want to drop it into a nice, light-colored pilsner vinegar. I used my red wine mother for this dark beer vinegar and it came out fine. And notice that it changed color to match that of the dark beer? What beer did I use here? Black lager. I’ve also made it with porter and with a pilsner. All very different, all very good. Don’t have a vinegar mother? Well, if you are sporty, you can let nature do it. Or, rather nature’s little vinegar helpers, the fruit fly. Yep. Keep the beer outside and let the fruit flies land on it. Once you see a couple dead ones on the beer, now you can cover the crock and continue on your way. Now, wait. It takes a month or two for the vinegar to really be ready, depending on how large a batch you are making. Taste after a month. Also, watch for the mother to sink. That’s a good indicator you need to either finish this batch and start a new one, or add to this batch — it means the mother needs more alcohol to eat. 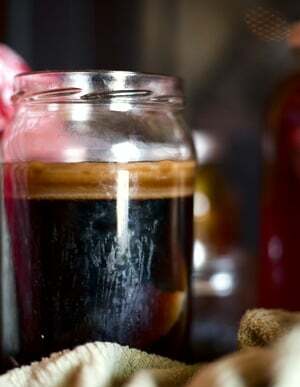 Strain the vinegar through cheesecloth or a paper towel into a Mason jar and you are good to go. I prefer living vinegars, so I don’t heat mine, but if you want to stabilize your vinegar, you need to gently heat it to 140°F, which is steaming, not simmering, and hold it there for 10 minutes. If you plan on giving vinegar as a gift, you should do this, otherwise you’ll soon have little baby mothers in the jars. Another option? Strain the vinegar and put it in an oak barrel. Yeah, I don’t have a barrel lying around either. There’s a cheaper way: Put the finished vinegar in a big jar and drop a bunch of oak cubes into it. Bam! Instant oak barrel. You want about a handful of cubes per quart of vinegar or so. Taste it after a couple months to see if it’s mellow and oaky enough for you. Your taste is your guide. There you have it: The easiest vinegar you can possibly make, and one of the coolest. Anaon: You can’t keep adding it, or the vinegar will never finish. It can be either fresh or stale. One question, can I use some mother from a bottle of vinegar sitting on my shelf to start this? Just add it to the beer? I make a good bit of kombucha. Can I use the mother from my kombucha as a starter. Oh and by the way, I have your book, “Buck, Buck, Moose” and I absolutely love it! I started using the bottom of the glass end of the night beer to make a multilayered vinegar that I use in a lot of BBQing. Just keep an old clay pot in a cool dark place and add that list gulp from your glass. You’ll never miss it and you’ll have an abundance of free vinegar.